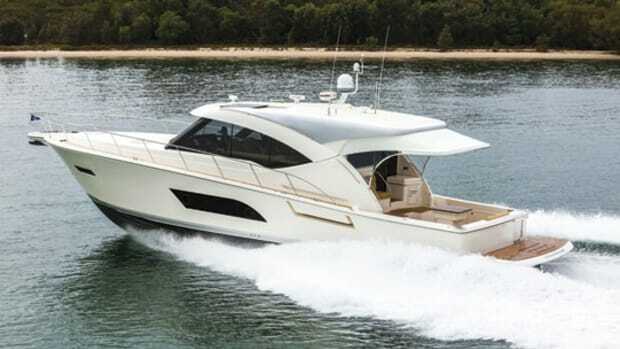 Australia-based Riviera Yachts is known stateside for its line of convertibles, but the builder made a big splash at last year&apos;s Fort Lauderdale International Boat Show with a two-stateroom, 36-foot express. 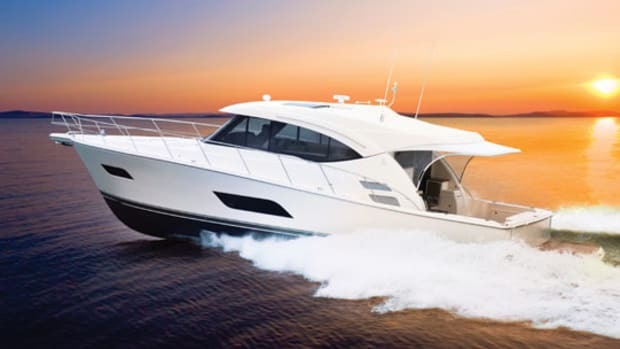 Now, to appeal to those with bigger families—or more friends—Riviera has upped the ante with the three-stateroom 4700 Sport Yacht. 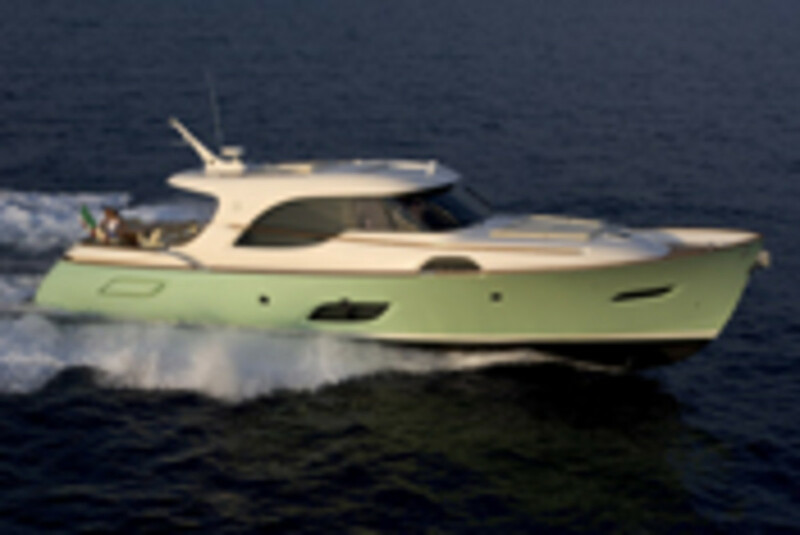 The 47-footer takes her kin&apos;s concept of one-level living and expands it. The resulting flexibility of the saloon-helm area is outstanding: Aft, a glass and stainless steel door folds away, and the bulkhead&apos;s expanse of glass flips up and latches firmly into place to the hardtop. 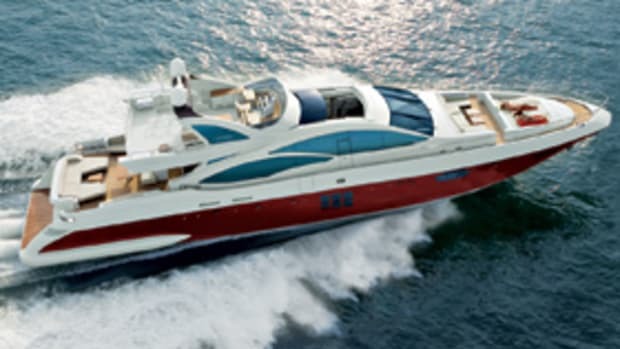 Both the sunroof and side windows electrically open to complete the alfresco transformation, allowing those sitting at the saloon&apos;s C-shape settee—or in the galley directly opposite it—to enjoy the breeze and communicate easily with guests in the cockpit. 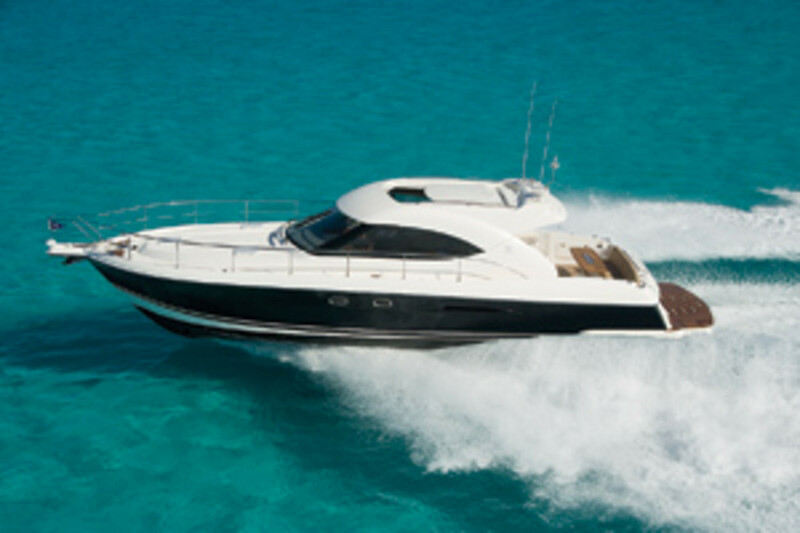 The saloon is also great for movie nights, courtesy of a standard 26-inch LCD TV and Bose Lifestyle stereo system. 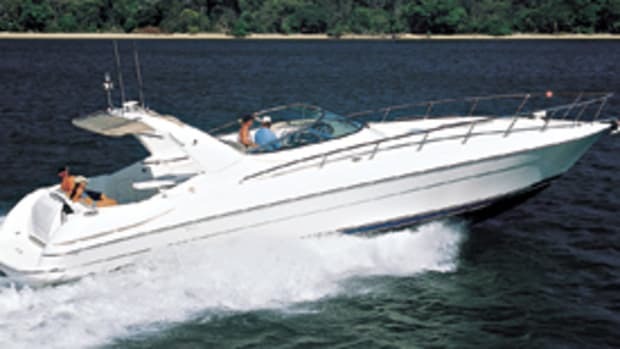 And if it gets too hot, just close up the saloon and turn on the standard 24,000-Btu Cruisair air conditioning. Like the saloon, the cockpit is meant for entertaining. The teak dining table seats six comfortably; lower it via two gas-assisted Besenzoni pedestals and add cushions, and it becomes a two-person sunpad. A wet bar with refrigerator and ice maker are just to port and forward of the settee, while an optional extendable awning can shade the entire cockpit. 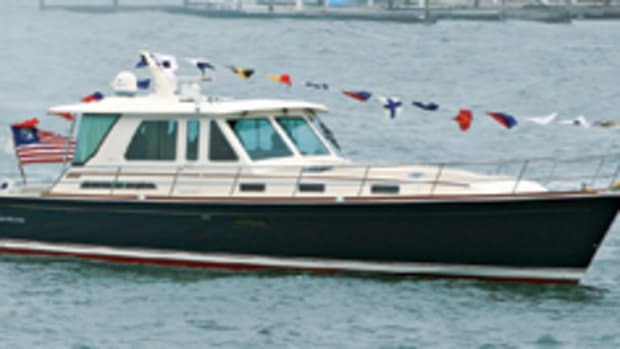 To free up space in the cockpit, the standard electric barbecue is transom-mounted and opens aft, so the chef stands on the port side of the swim platform when grilling. 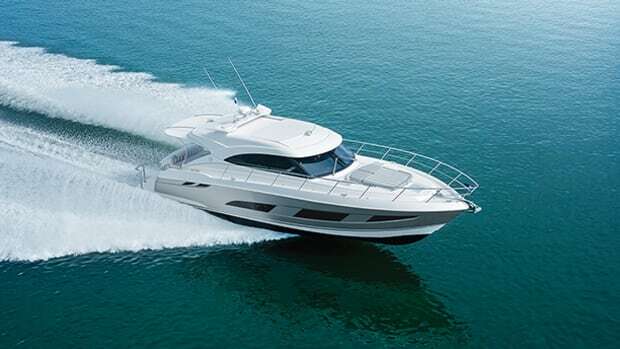 But because the forward few feet of the platform is fixed, guests can still access the centerline tender garage via an electrically activated hatch (where the standard ten-foot Zodiac RIB is stowed) and use the swim platform, which lowers hydraulically. Standard power on the 4700 is twin 567-hp Caterpillar C7 ACERT diesel inboards, with the option of twin 715-hp Cat C12s. Pricing starts at $845,992. 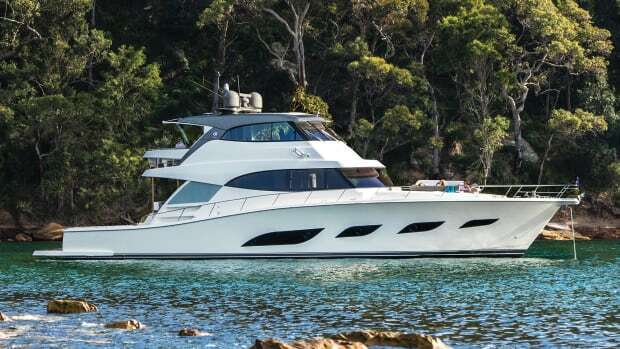 Like the 44-, 51-, and 74-foot models in Mochi Craft’s Dolphin line, this 64-footer takes exterior styling cues from Downeast lobster boats with a twist courtesy of Italian yacht-design outfit Victory Design and Ferretti Group engineers. But unlike the other Dolphin models, the 64 has a sunpad on the aft section of the saloon roof, accessed from the cockpit via teak steps. 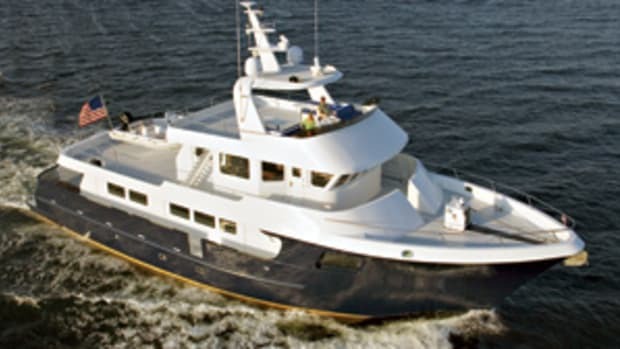 Features include a teak-covered cockpit, side decks, and foredeck; teak and maple soles in the saloon, galley, and staterooms; a hydraulic swim platform and passerelle; Bisazza mosaic tile in the master head; and a tender garage. The jet-drive tender is optional. Standard power is twin 1,100-hp MAN diesels; 1,360-hp MAN 1360 CRMs are optional. U.S. pricing was not available at presstime.